At the last Stake Conference a speaker talked about helping to bring your family closer by establishing a family motto. This motto contains what’s important to you and your family. I decided to make this for my father and ma. I will also make one for my other parents and add some scripture based values. To tackle this project, I used the letters of our last name to start each sentence. The background are the colors of our family crest and tartan. 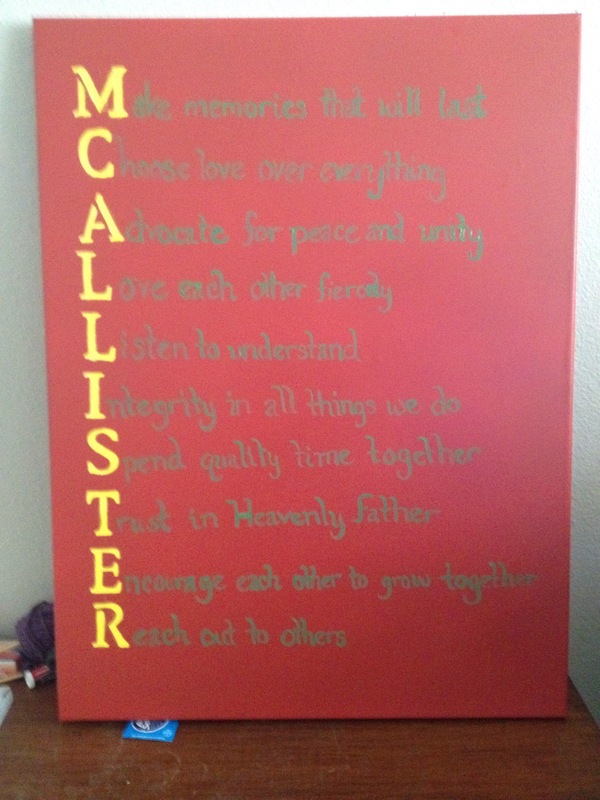 I spray painted the background red and used yellow acrylic paint and stencils for our last name. Then I wrote the values out in pencil and went over them with a paintbrush and green acrylic paint. Here’s how it turned out! I do plan on going over green with another coat mixed with a tad bit of white to lighten it up.